J.E.T.’s name is not only known to progressive Italian rock fans, but also to a wider audience, given that from their ashes, already in the mid-’70s, the soon-to-be-famous Matia Bazar were born: this new incarnation was able to rework J.E.T.’s last phase most ‘commercial’ hints, leading to a long successful career that still goes on today. 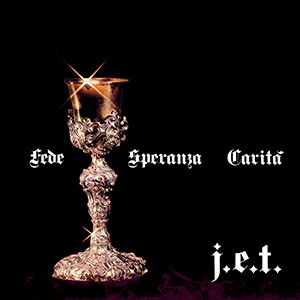 Contrarily to what these words might suggest, J.E.T.’s only LP, originally published in 1972, is so far from the term ‘commercial’ as close to the Italian prog of the golden age: four long and complex tracks – plus the short ending “Sfogo” – with religion-themed lyrics, strong hard rock influences, a solid rhythmic section, keyboards always in evidence and beautiful vocal harmonies, sometimes reminiscent of the typical New Trolls’ falsetto. A timeless album, which still today leaves the listener astonished for its beauty and magniloquence, but also a bit disappointed by the fact that the band didn’t manage to release a follow-up to this masterpiece. Already reissued on vinyl (AMS LP 27) by AMS Records, “Fede Speranza Carità” is now, for the first time in the history of the AMS record label, also available in the papersleeve CD format, with two bonus tracks drawn from the various 45rpm’s that J.E.T. delivered during their short career: two examples of how the band was able, even on a ‘short time span’, to produce small beautiful gems. A must!